While the 13th annual Macau Food Festival was being set up under the shadow of the Macau Tower, my job’s lunch room was abuzz with debate. Over dishes of ox tail soup and squid ink noodles, my coworkers tried to decide whether or not the food would be good and if the festival was only meant for tourists. I was on the fence, but agreed to go when a friend asked me to join her and her family Saturday night. When I heard the sweet sounds of a Filipino band singing Whitney Houston’s I Will Always Love You, I knew I had made a good decision. The selection of food was pretty vast with five distinct categories: Chinese, European, Asian, Local, and the popular Dessert Zone. I followed the lead of my friend as she gathered an array of barbecued meat, pickled squid, vegetable egg rolls, and dessert. Just when we couldn’t possibly eat any more, her nephew brought over a fresh batch of chicken & black peppered beef on skewers. After placing them on the table, her nephew told us about a fight he had just witnessed in which a woman was slapped in the face. While he debated whether or not to intervene, I became distracted by a little boy playing near his grandmother. The boy was having a pretend Kung Fu fight with his sister and it reminded me of a talk I had with my mother when I was 6 years old about the right to say no and defend myself. A few weeks after that conversation, my aunt took my sister, cousins, and I to get haircuts. We had all walked into the salon together, but within a few minutes my aunt was occupied by one of her friends who worked there. Left to our own devices, my cousins and I were wandering around the lobby when a tall man with long blond hair and black clothing came up behind me and started to run his hands through my hair. “Please stop touching me,” I channeled the wise words my mom had taught me to no avail. The stranger’s fingers continued caressing my Annie-esque red afro. “Please stop touching me,” I repeated. When he didn’t heed my warning I lifted my arm in front of me, jammed my elbow back (not unlike the motion of pulling a slot machine handle), and let loose a thunderous CHOP. My elbow struck the man directly in the groin, dropping him to the black and white checkered tile floor. I stood proud while my sister and cousins looked on in awe. My aunt, on the other hand, was aghast and scolded me for hitting my hairdresser. I might have made a bad Sherlock Holmes, but in the moment I felt like an iron fisted Karate Kid; the tiny tot underdog who triumphs against all odds. After a few more plates of food, our group decided to call it a night. 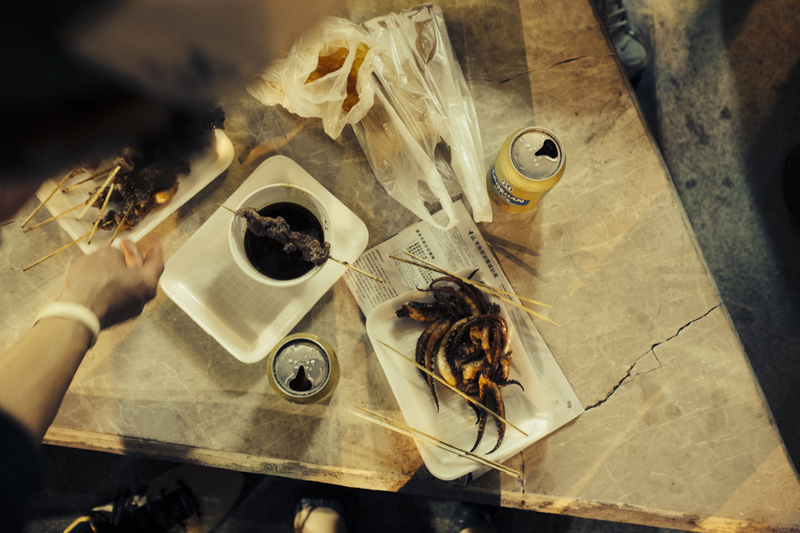 The Macau Food Festival was in full force and the two siblings were still pretending to fight when I left. I couldn’t understand what they saying to each other, but if their grandma was as wise as my mom then they must have been practicing their stranger danger Karate chops. It would make any mom proud.